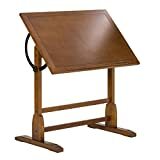 Whether you are an artist or a designer, having the drafting tables where you can make your designs is highly important. 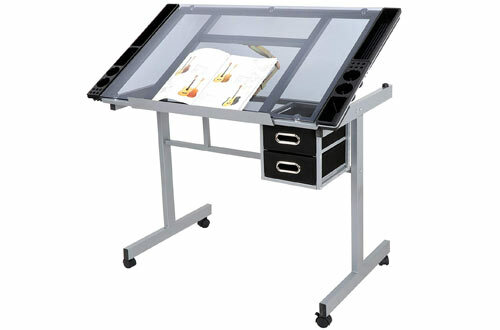 The tables hold your drawing sheets into proper place and also come with pencil holders. 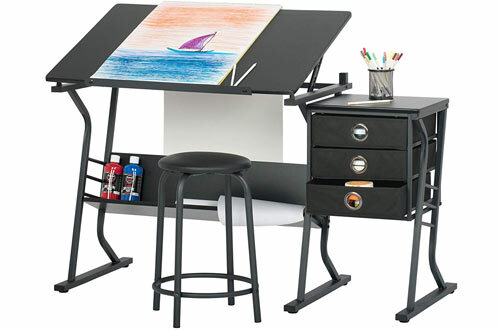 Practice your drawing skills in the desk and allow no disturbances while busy in the making process. 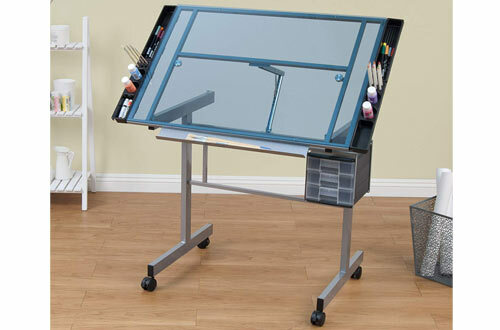 Plus, the best thing about these drafting desks is that they are easy to use. 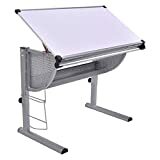 It allows you to use sheets of varying sizes without any hassle. From adjustment in height to a comfortable stool to sit on, you can have it all. But acting smart is the tactic behind making the best buy. 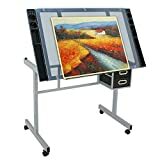 Well, there is nothing to frown upon since have gone through a lot of hard work for creating a listicle of drafting tables top. You need to shed away any worries you would have with the sturdiness of the table since it is made of excellent materials. 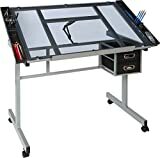 The 28” to 35.8” drafting table adjustable height regardless of its firm built. With a strong steel frame assisting the MDF board construction, the table is not only sturdy but very durable. Further, for your long work hours, Zeny has provided a comfortable padded stool. Also, the legs have pads attached to it for maintaining steadiness and keeping your floor safe. Maximum inclination of 45 degrees. Two generously sized drawers for storage. Legs are powder coated for longevity. The table is designed in a way to keep all your supplies within reach. It gets its stability from heavy gauge steel and equally, the floor levellers further improve on that factor. Even when you tilt the top, the 24-inch pencil ledge can be slid up and fixed into position. Not to mention, this feature alone gives you quick access and keeps your work environment organised. 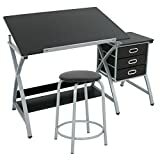 The overall black design makes this table look like the throne of your craft room. Overall work surface over 35 inches in width and over 23 inches in depth. Long 10 years of warranty period. This table doesn’t just let you create art but is a work of art itself. The premium wooden construction gives you an organic feeling that the cold metal surfaces don’t reciprocate. 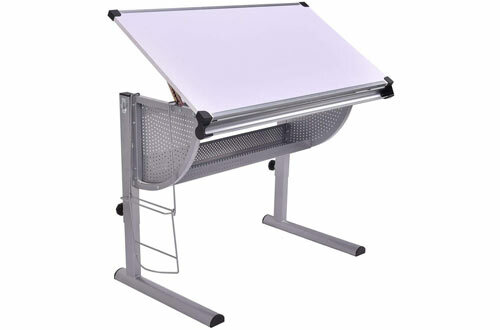 Nevertheless, it gives you abundant work space with its 36-inches by 24-inches surface. You can adjust the tilt from 0-degree to 90-degrees giving you a wider range than most competitor products. Pencil ledge of 24-inch to keep off supplies from falling during tilt. Deep wooden feet that keep a firm hold. After all, the sharp and sleek design adorned with silver/black and tons of functionality makes it a draftsman’s dream product. 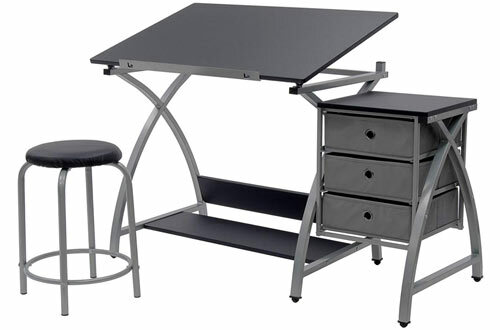 Definitely, the steel arc structure with its powder coating makes up a stable workstation that can handle prolonged use. Be it for crafts or drafting, you always require abundant supplies. For that purpose under the desk, you get big storage shelves. Workspace features an inclination to 20-degrees. The rigid steel frame used to make this product is astonishingly strong and can easily support well close to 99 pounds. Meanwhile, the 41-inches wide working space along is much larger than what others offer in the market. Plus, it even gives you a fair degree of customization with removable multi-slot and single slot trays on either side. 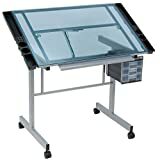 Apart from these, the drafting table design features slide-out drawers as well as single-slot supply trays. Made of heavy-duty tempered safety glass. Mobility and firmness are well balanced for 4 360-degrees casters, 2 of them lockable. Studio design never fails to impress with its unique innovation that sets its products apart from the competition. With this model, they have repeated their ingenuity. They provide you with a stool with this table that is not only padded but with heights adjustment capability from 20-26 inches. Alongside, cleaning and maintaining this table is hassle-free since it comes with removable trays. With construction of steel sufficiently coated of heavy gauge powder, the wheels enable smooth movement and the tempered glass assures no breakage. 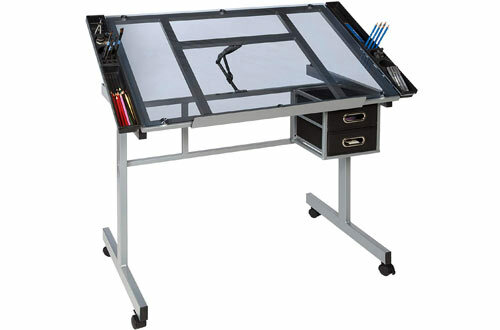 Multiple pencils and other tools are suitable for putting in the 24-inches tray. 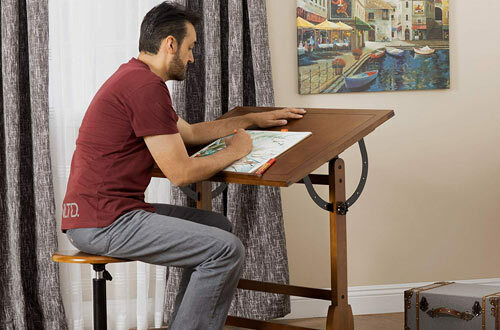 Having brackets, the table top is adjustable to tilt 70-degrees. 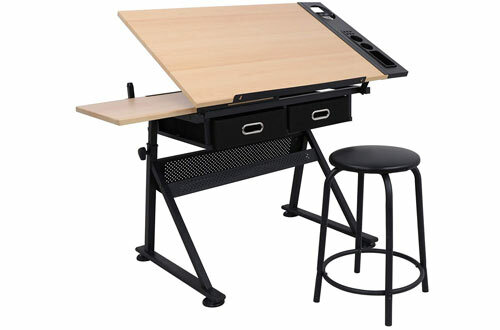 This table top allows you to work with extreme precision without hindering your creativity. Interestingly, no matter what angle you want your tabletop to be inclined; your supplies are always held in space. If you want to change the location of your table, you can easily do so with the help of the 4 casters. Moreover, the lock feature guarantees the safety of 2 of them. Just the design is so sleek and appealing, for this reason, it sets in seamlessly within any room. Comes with removable supply trays. Blue tempered glass emanates the beauty. 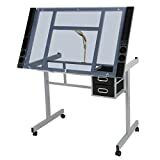 Compared to traditional furniture, this drawing table can be easily assembled by even an amateur. 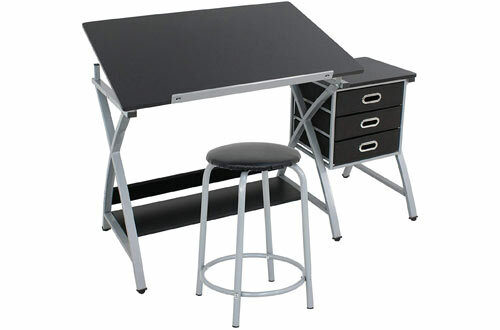 Built For your comfort the 20-inch stool is padded adequately to let put all concentration on your work. To your surprise, the table even offers several leg extensions. Furthermore, the footrest is capable of withstanding a weight of maximum 150 pounds. And the incorporation of the MDF board in the strong steel frame makes it a smart choice. The user-friendliness of the table is pretty visible as it offers 10 extra foot pads. The frame is rust-proof for the exclusive powder coating. The inclination of the table is maximum 48-degrees. With an intuitive design and great affordability, this MDF and steel construction table will increase your productivity by manifolds. For you and your colleague’s better usage, it presents different heights since it has a height adjustability feature. In the metal groove, you can even store various tools for drafting or painting purposes and have instant reach. Being a foldable table, you also get added storage space along with the support of a powder-coated steel frame. Edge has two rulers for better observation. A damp cloth is all that’s needed to clean accumulated dirt over time. 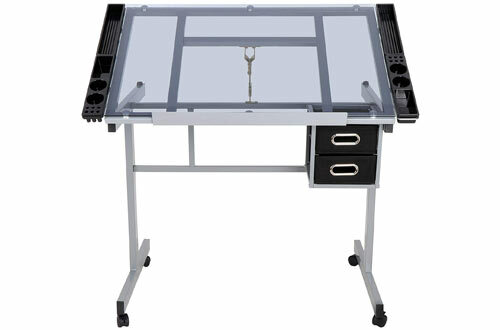 Space might be a rare commodity but not when it comes to this great drafting table from Super Deal. Apart from the gigantic 41-inch wide working space, you get 2 drawers with ample room for storage. It has top-notch build quality with a simple yet rigid steel structure and the beautiful blue tinted tempered glass. Undoubtedly, a piece that will remain the favourites of craftsmen. Supplies are secured at any tilted angle. Tilts up to 62.5 degrees. Desktop easily supports 130 pounds and below. 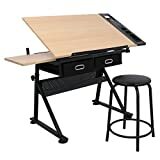 Let out your inner artist and start making the creative arts on the reliable drawing and drafting table desks.